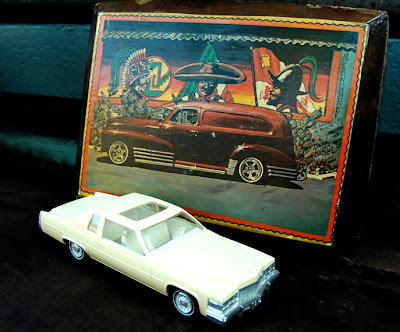 Having purchased the shellacked page from Low Rider magazine earlier in the day, I didn't assemble the above lowriding tableau until I returned home from this week's garage saling and unloaded my finds. The 1979 Cadillac was covered in dust and found in a box of miscellany at another sale. From the 1950's through the 1970's, when you bought a new car you would receive a promotional model as a bonus. At some point, the Big Three decided that a plastic pint-size replica was a tacky gift for the purchaser of a new Cadillac. 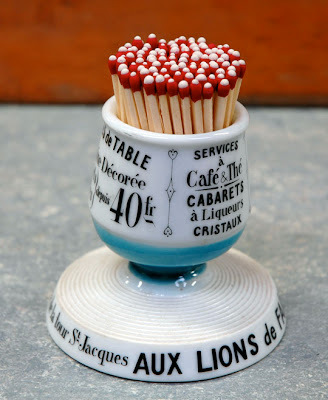 The classic French bistro match holder makes me want to smoke a hundred Gitanes and debate existentialism.